After many years, Savvy Sis finally became a member of the Chanel bag club. For some reason, she just wasn't a big fan. 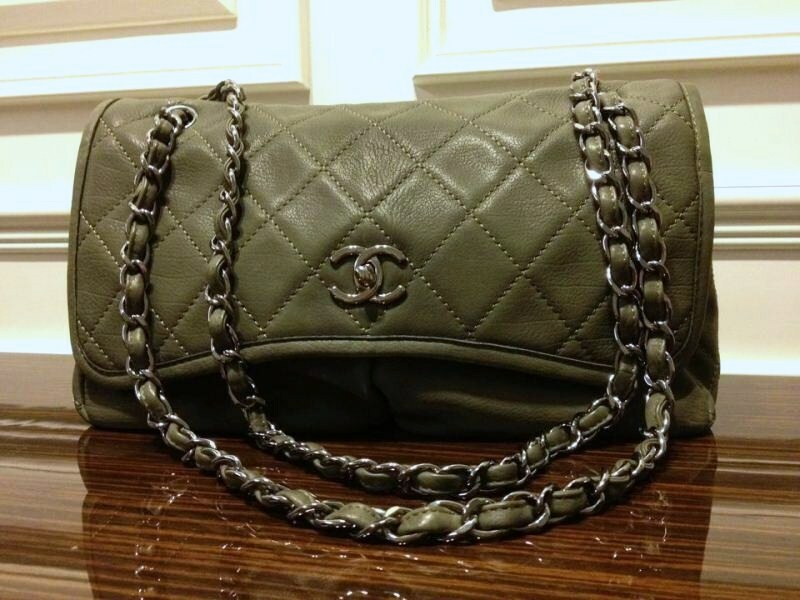 That is until she saw this military green Chanel bag after dinner the other night. The bag is classic but still casual, which fits her lifestyle perfectly. 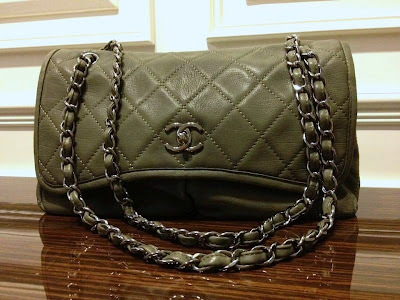 Unlike class Chanel flap, this bag is less structured, made of oiled lambskin which is more durable. With my other Chanel lambskin bags, I swear sometimes if I look at it wrong, the bag will have scratches. Speaking of military green, the color seems to be very popular. I am seeing military style color, and designs. Is this color going to be carrying forward into fall/winter, I wonder?? Savvy Sis said this bag is very easy to pair with her outfits. Yay... cost per wear will be low. Do you like military green this season?? It's such a pretty bag. I love the colour. I still need to buy my first Chanel bag. Beautiful bag & love the color! Gorgeous bag, darling ~ congrats! gorgeous! love the bag!! actually i feel that lambskin bags aren't as awful as people say they are to maintain.. yes they scratch easy but it's always really easy to get the scratches out.. just rub your finger over them and your finger's natural oils take the scratches out.. whereas everyone says love durable caviar is.. which to an extend is true because it's difficult to scratch HOWEVER once you scratch it you CANNOT get the scratch out whatever you do!!! I'm not part of the club, cause everytime I have the money I use it for some other bag ...I don't know why. I just LOVE that Chanel bag!!!!! Congrats to Rowena! I have a couple of military green and brown JCrew skirts that I use to pair with almost everything - it's such a great work horse color! Love the Chanel bag! Oh I am in love with that bag! Yes to military green! Thanks for stopping by my blog, hope you'll come by again. I just started following you, can't wait to see more.